One of the most striking features of The Law of Nations is Wolff’s single-minded dedication to what he calls the “scientific method.” Though different from what we understand by that today, Wolff’s method still focuses on the illumination of truth via a step-by-step, logical examination of what is already known in order to explain what is unknown. 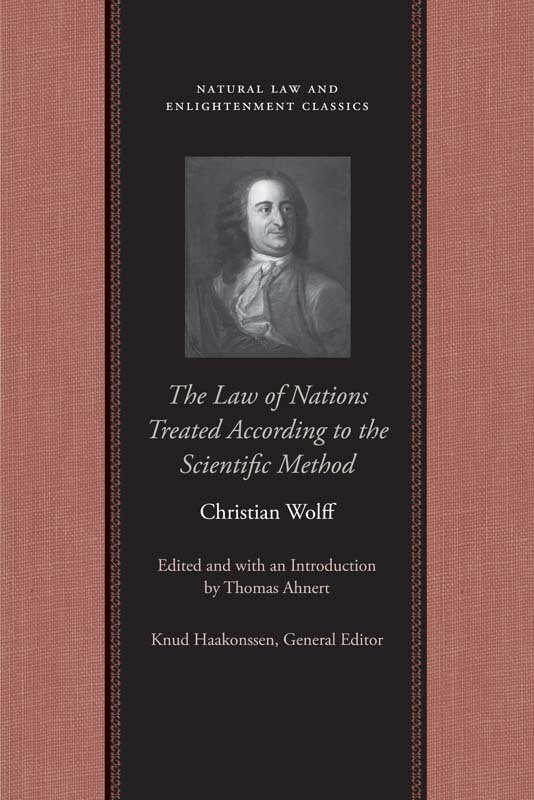 As such, The Law of Nations is Wolff’s triumphant synthesis of his scientific method and his observations regarding the operations of nations. It examines the full gamut of national functions: what duties nations have to themselves and to each other, how national ownership should be viewed, how treaties should be formed, and how nations should act in both war and peace. Though Wolff’s contemporaries in authority did not always accept his ideas—he was banished from the lands of the king of Prussia for seventeen years for his radical notions regarding moral obligation and human free will—his influence ultimately spread across Europe, shaping philosophical study in many German, Dutch, and Scandinavian universities especially. The Liberty Fund edition of The Law of Nations is the first in English since the 1934 translation by Joseph H. Drake. Thomas Ahnert has revised and corrected that translation for readability and accuracy and has also added footnotes that explain the many references and technical terms Wolff uses throughout the text. Thomas Ahnert is Reader and Head of History at the University of Edinburgh, Scotland. Among his publications are The Moral Culture of the Scottish Enlightenment, 1690–1805, an edition of Thomasius’s Institutes of Divine Jurisprudence, and Religion and the Origins of the German Enlightenment. Introduction, note on the text, abbreviations, bibliography, index.